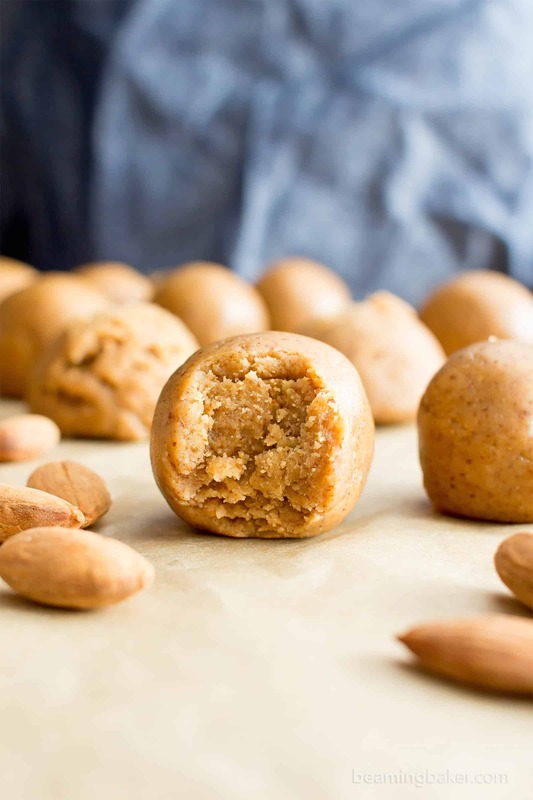 3 Ingredient No Bake Almond Butter Paleo Energy Balls (V, GF, DF): an easy recipe for perfectly sweet, seriously satisfying no bake paleo energy bites. Vegan, Paleo, Gluten-Free, Dairy-Free. So did I tell you, I’ve been going to the same gym as my mom? It’s equal parts awesome, hilarious, a tad dodgy, and again, hilarious (yes, that’s two parts for hilarity). You guys should see her! She always has on the cutest gym outfits, is beaming like no other, asking if we have any almond butter cups or homemade KIND nut bars stashed in our gym bags to share, and she loves to hug both me and Erik, regardless of what phase any of us are in our workouts. Hint: we are usually all varying degrees of awkwardly sweaty. A mother’s love… what can I say? Of course, I have to pester her and ask her why she dresses waaaay cuter for the gym than for when we hang out. Are you reading this, Mommy? Ahem! Anyway, when Erik and I were first talking about going to my mom’s gym, at first, I was totally like, “No way!! I’m not going to the same gym as my mom! She’ll be able to track my movements and see if I am, in fact, too busy for dinner,” etc. I know, I know, I’ve got to be a better daughter. 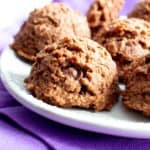 I will say that I did bring her these 3 ingredient no bake almond butter paleo energy balls and a batch of no bake almond butter paleo brownie bites last time though! But then, I started really looking forward to seeing her, like every day. Proud mama’s girl right here. 🙂 The moment she sees me, she smiles like the sun. I’m totally grinning just thinking about it. There’s nothing quite like it. ???? So now that we see her on a daily basis at the gym, we’ve taken to exchanging requests for things (update: she’s now asking me for my latest almond butter recipe: gluten free almond butter chocolate chip cookies), hassling each other about an upcoming event, and of course, poking fun of each other. Meanwhile, my mom’s taken to dropping hints about what recipes she’d like for me to work on next, and what dessert requests she has for the weekend (gluten free peanut butter cookies, 5 minute homemade fudge) and what cute new workout clothes she can recommend for me (gee, thanks, Mom! What are you trying to say??). 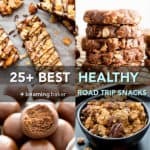 She recently requested a super easy, super simple nutrient-rich snack for the gym, so I whipped up these 3 ingredient no bake almond butter paleo energy balls and this homemade chunky paleo granola. My mom loves almond butter, especially for gym snacks. She says that it’s easier for her to eat repeatedly than peanut butter. I think it’s because of the taste factor—it’s so much more neutral! 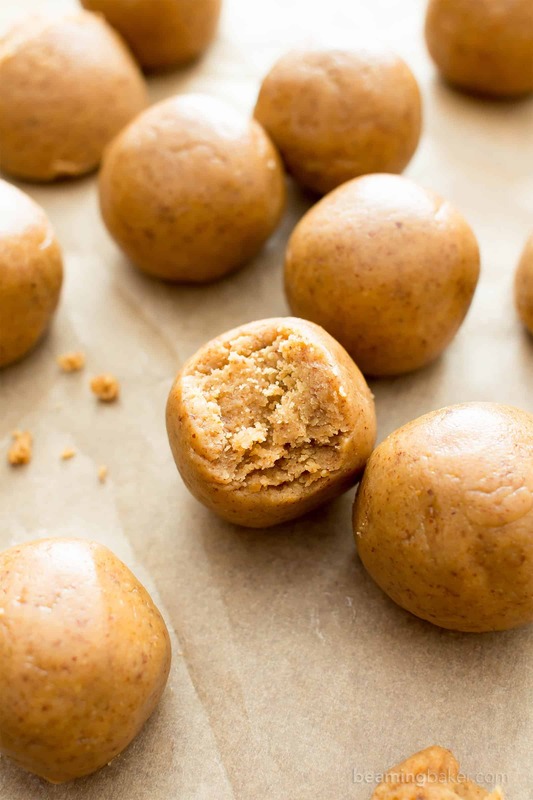 quite possibly the almond butter energy ball you’ve been looking for… for ages! I hope you love these 3 Ingredient No Bake Almond Butter Paleo Energy Balls as much as my mama does! And if not, she’ll make you join her gym, then hassle you about not liking my recipes everyday. J/k!!! J.K. 😉 Are you ready to grab your cookie scoop? I’ll grab all the almond butter and meet you in the kitchen. It’s no-baking time! It’s truly such a pleasure to make these treats with you. Thank you for being here and experiencing these kitchen adventures with me. I simply can’t wait to hear what you think! In the meantime, be sure to sign up for my free email list so we can keep in touch! ???? 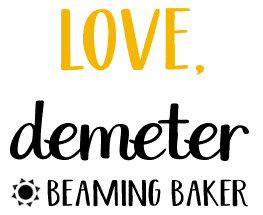 Sign up here: free Beaming Baker email list. ← ???? 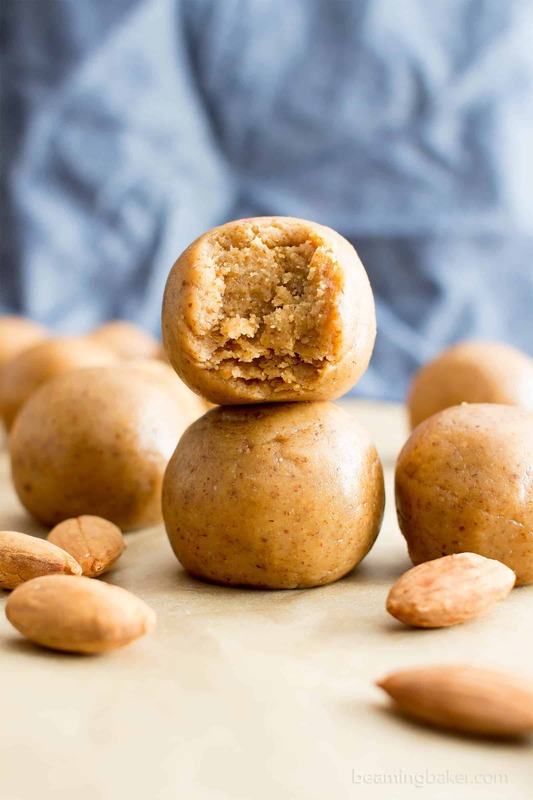 3 Ingredient No Bake Almond Butter Paleo Energy Balls (V, GF, DF): an easy recipe for perfectly sweet, seriously satisfying no bake paleo energy bites. Vegan, Paleo, Gluten-Free. Line a baking sheet with parchment paper or wax paper. Clear some space in the freezer for this sheet. Set aside at room temperature. In a medium bowl, add almond butter, maple syrup, and coconut flour. Whisk as long as you can. When the mixture gets harder to stir, use a rubber spatula to fold until well incorporated. Fold until thickened. Cover bowl and freeze for 15-20 minutes. Remove from freezer. Using a cookie scoop, scoop and drop balls onto the prepared baking sheet, spaced evenly apart. Here are the 1-tablespoon and 2-tablespoon cookie scoops I use. 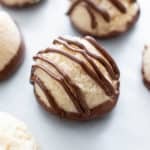 - Adapted from my 3 Ingredient Peanut Butter No Bake Energy Bites. - Freezing instructions: store in an airtight container in the freezer for 1-2 months. Firm, but soft enough to eat straight out of the freezer. 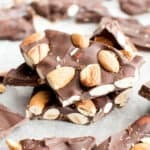 - More paleo almond butter recipes: almond butter fudge cups, chocolate almond butter frosted fudgy brownies, no bake chocolate almond butter bars. Those look so yummy! I love healthy portable snacks like this. Perfect to take with me to work! Oh YUM! 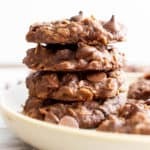 I saw no bake and decided this was a recipe for me 🙂 Love the idea! 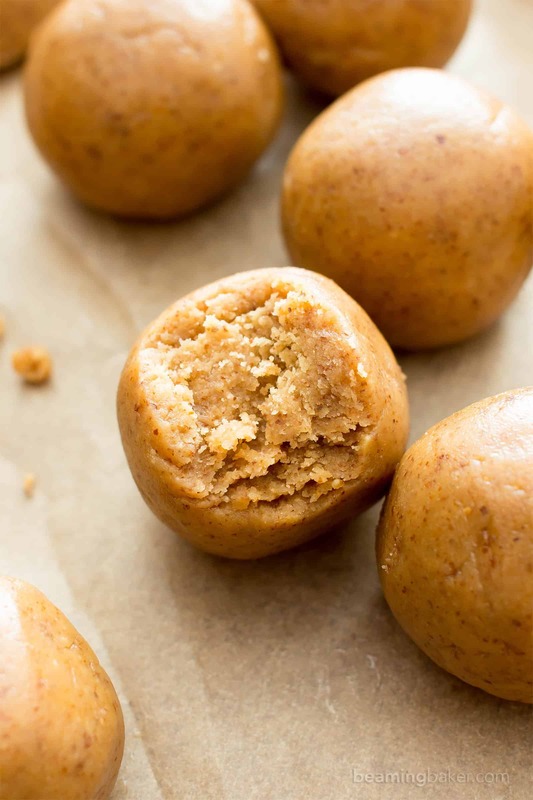 These little energy balls sounds really tasty, and so easy to make. Perfect for that boost of energy you need at times in the day. Lovely to read about your gym exploits with your Mother, I imagine that can be all kinds of fun. Love the flavors in these energy balls! 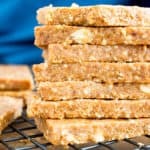 Great for a gran n go snack! They’re so yummy! Thanks Carrie! OMG! I want a batch right now. These look SOOOO good! Hehe! That’s the reaction I was hoping for! Hope you love it. I love how easy these are! My boys would love them in their lunch! Yay!! The easier, the better. 😉 Hope you and your boy enjoy! i need some of these today!! They look great and easy to make which is a bonus! Sounds like great mother/daughter time! And these energy bites are perfect for snack time! Hehe! Yeah, it is!! Speaking of which, I better go to the gym today. ???? I absolutely LOVE these!! I can’t wait to make them for my kids!! Thanks Katerina!! Hope you and your family enjoy! ???? How fun to see your mom at the gym! I wish I could see my 86-year-old mom at the gym, but we live in different states 🙁 And, um, she goes waaaaay more often than I do (go, Mom)! These are perfect for a healthy snack! Love. So much fun!!! 🙂 Dang… go mom!!! And who are we kidding, my mom is WAY better at going to the gym consistently than I am. Lol. 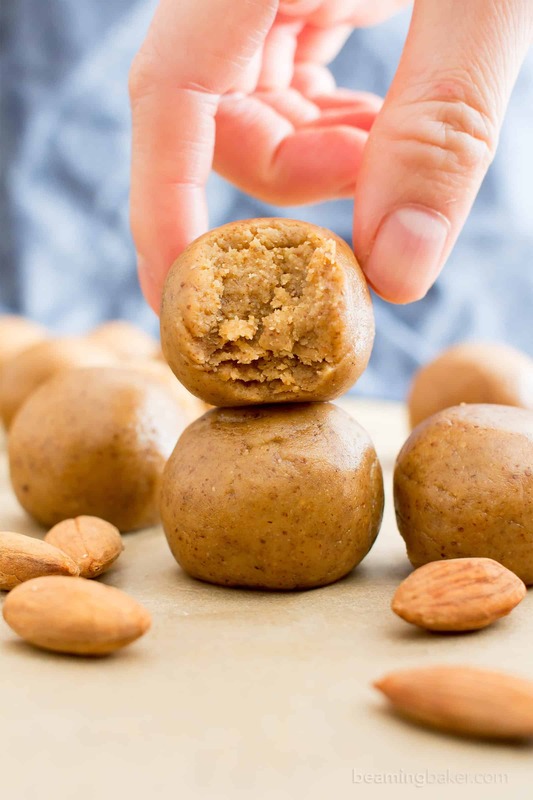 These almond butter energy balls sound so good! I can’t wait to make a batch! Thanks Anna! Hope you enjoy! These look good. Can you make them with honey as opposed to maple syrup? I know that wouldn’t make it vegan. These look really good! 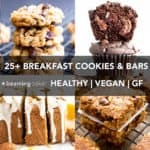 Perfect snack for morning runs! Thanks Sandra! 🙂 So, so true. These are great!! I had almond hazelnut butter, so I used that and also added 1/4 cup of cocoa powder. 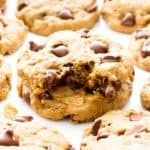 They remind me of Nutella + cookie dough! Oh. Em. Gee. That sounds SO good, Amy!! I’m looking forward to making these. One question, can you use agave syrup in place of maple? Hi Esther! Yep, agave should be fine. Happy no-baking! ???? Awesome, thank you so much. 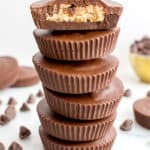 I’m going to make them tonight and let you know how it went!! OH MY GOSH!! These are the bomb!! The agave worked great and they are delicious right out of the freezer. Soooo good! Amazing recipe, thank you! i made these! Used raw honey instead of maple syrup as per my SIBO/SCD diet. Also, i added about 2-3 tbsps cinnamon (may have been more, just sprinkled it in) and I LOVE them 🙂 The cinnamon gives me some pumpkin pie vibes with the consistency of the energy balls. Woohoo! So happy to hear you enjoyed them Felicia! And I’m living the whole pumpkin pie vibes, btw. ???? 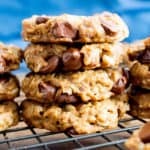 Can I use oat flour to replace the coconut flour ?